Students from the University of Pittsburgh School of Pharmacy visited Mt. 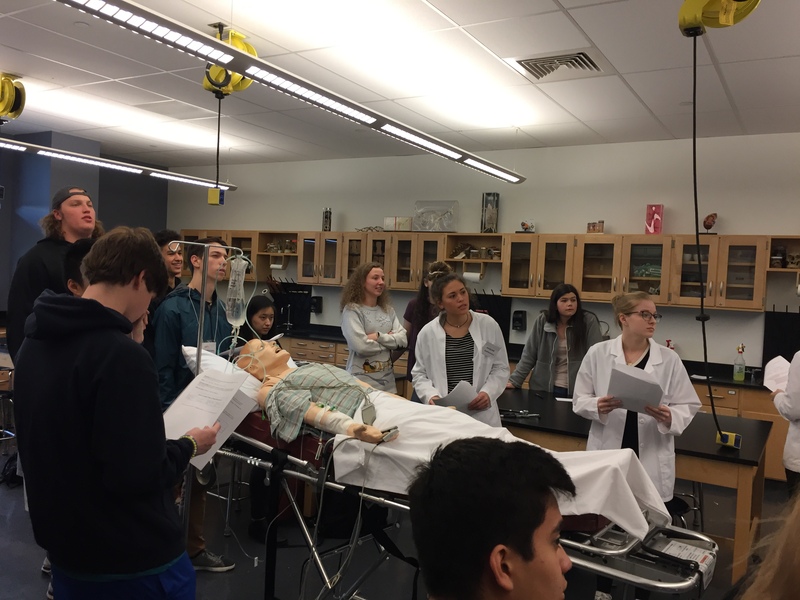 Lebanon High School in December and brought Sim Man with them to give our students an authentic, real-life experience of what a pharmacist in a hospital setting might experience. Sim Man is a life-size human model that provides a high fidelity simulation of a medical condition while exhibiting lifelike functions. As students entered Mr. Ray Schrader's classroom, Sim Man was on a gurney, in a hospital gown, experiencing a heart attack. 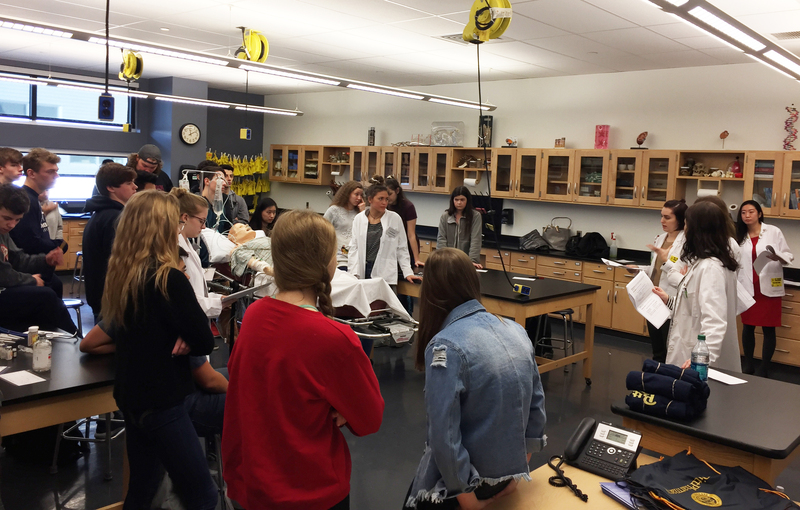 The Pitt Pharmacy Ambassadors were able to take Sim Man's blood pressure and vitals while listening to his heart as he experienced a simulated heart attack. All bodily functions were tracked in real time on the TV monitor in the classroom. As the pharmacists walked through the process of diagnosis, they determined the medications necessary to treat Sim Man's condition. 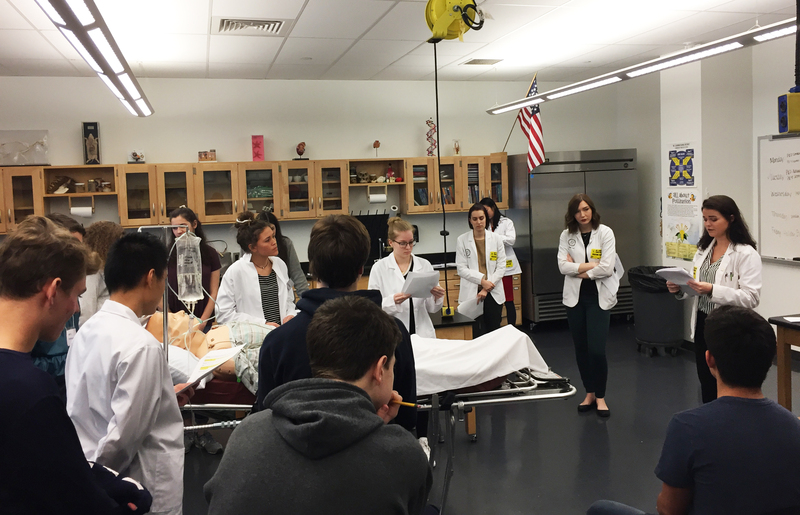 Students observed the pharmacists in their role as medication experts, while they determined the appropriate, lifesaving treatment for a patient in an emergency room setting. By the end of class, Sim Man's condition stabilized.The Sim Man simulation was as close to an authentic, real-life hospital emergency experience as you could get and it provided an extraordinary learning opportunity for our students. A goal of the Pitt Pharmacy program is to share with students the many career opportunities in the field of pharmacy. While our neighborhood pharmacists play an important role in our health care, there are many other career opportunities for pharmacists in the Emergency Room and hospital pharmacies, as well as clinical pharmacists in the ICU and transplant pharmacists. We would like to thank the University of Pittsburgh School of Pharmacy for sponsoring Sim Man's visit to Mt. Lebanon High School and to the Pharmacy Ambassadors who provided our students with a once-in-a lifetime experience. Hopefully, this visit will inspire some of our students to pursue one of the many exciting careers in pharmacy.